Happy Thanksgiving to all my fellow Canadians! I'm pretty stuffed from turkey and stuffing, not to mention dessert. Thankfully I have today off to relax and enjoy some quality time with my boys (hubby and son). Every year I reflect on all the things I am thankful for. This year, I can say that I'm thankful that I have been employed with the same company for 15 years! I can't even begin to imagine how many people don't stay with the same employer for that long anymore, but I have to say I'm happy that I have. the shoulder I can always cry on, so I'm always thankful to have him. Now on to the outfit. This delicate and gauzy voile and lace midi dress is endlessly summer but also so perfect for a beautiful autumn day. I seriously only needed a leather jacket and its the perfect look for a beautiful sunny autumn day! The gathered tie neckline creates tiny pleats that lend an easy, loose fitting silhouette and it super comfy for an all day wear. Love your lip color in these pictures!! I have been with the same employer for ten years now and just can't see going anywhere. It's nice to know everyone and there are so many benefits that come with being loyal to your company! I love these shoes! The gray is so pretty! I love the boho dress paired with the more edgy accesories. Your styling is so cool. Talk about statement necklace! Love it! Thanks for linking up with us on Start the Week Stylish! Such a beautiful look. I'm looking forward to Thanksgiving here! It all sounds so yummy. your dress is so beautiful! Styled perfectly! Love this look! The blue dress is so elegant, then I love it with the grey leather and super cool booties! I love the combination of this feminine dress with the leather jacket. Great necklace too! What a cool look - I love the combo of boho & edgy! Love this outfit! The dress is so pretty and the navy and black looks great together! Thanks for linking up to Top of the World Style. Great Bohemian look. Interesting necklace! Pretty look, Crissy! 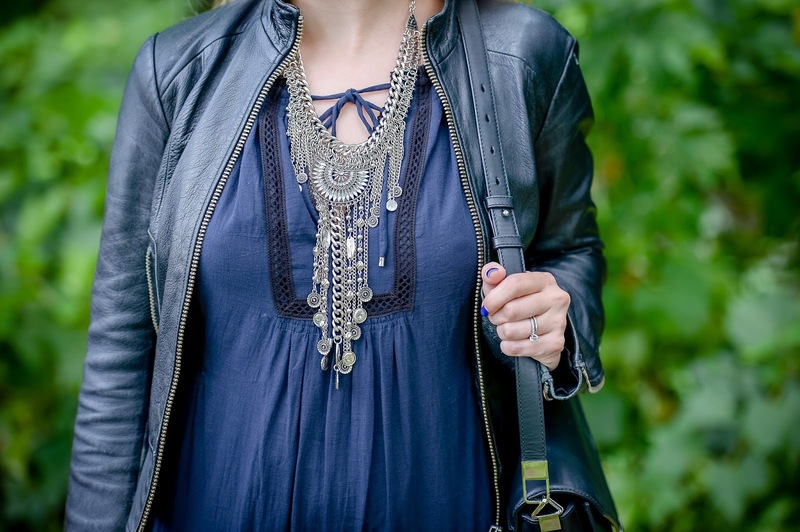 I love that statement necklace and you look fantastic in blue! Love how you transition this pretty summer dress for fall! Your dress is so pretty, but that necklace totally caught my eye. Gorgeous! Thanks for linking up with Fabulous Friday!